A man no stranger to Vandit’s discography, Scotland's Paul Trainer has been producing music for half a decade now. 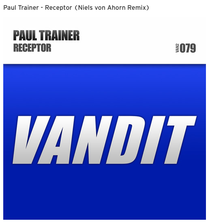 Following up the likes of ‘Totality’, ‘Face The Music’ and ‘Soundscape’, he’s returns to the door of Paul van Dyk's Berlin-based Vandit Records with ‘Receptor'. On his Original Mix, the young Scotsman forms a nucleus for the track of pounding drums and rolling bass, further synthesising the sonic compound with squally, psy-like 303 and high wire tense synth bursts. Into the drop, ’Receptor’ then opens up into a wash of immersive, mesmeric pads and chords, before Paul reconnects the drums and synths. Having already displayed his remixing skills on Paul van Dyk’s ‘If You Want My Love’ last year, for ‘Receptor’’s rebuild Germany’s Niels von Ahorn takes the tone darker and more driving. Recalibrating the track’s tempo to prog-trance pace, he swirls the atmosphere deep, creating an infectious linearism, then builds the mix with short drops and equally quick and effective bring-backs. It’s out now, check it below.